Geraldine Seward met the man who killed computers the day a homicidal twenty-meter-tall autonomous road builder plowed through the side of the building where she worked. Oh, you want more? Well, OK, here are a few more words, but you’ll have to buy the book to read the full story. Simply scroll down to see the links for purchasing the book. Dozens of her coworkers were killed instantly, crushed beneath falling debris and the road builder’s heavy tires. The machine did not stop at the perimeter of the hall. It advanced remorselessly, so tall it wrenched a path of destruction through the high ceiling, bringing down the floor of the level above. Geraldine screamed “Run!” at stunned diners as she stumbled backward. Her cries weren’t enough; more people were dying with each second. Even worse, she realized she had unknowingly brought this catastrophe upon them all. Mental illness is very common in our society, but it’s also very misunderstood. Many view those with mental illnesses as being weak, but there is a great deal of strength in those that must battle their own minds on a regular basis. 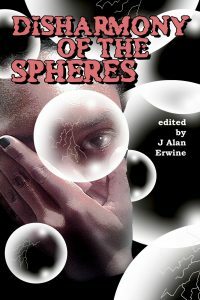 Disharmony of the Spheres focuses on characters with mental illnesses that are still able to be successful. They may not completely overcome their illnesses, but they are able to beat them back and succeed. This book is dedicated to all of the science fiction fans and writers that must battle their own personal demons every day, and half of all of the profits from this book will go to The Yellow Ribbon Suicide Prevention Organization, a group that battles teen suicide. Disharmony of the Spheres was released on the 21st of October 2017. This 184-page book is available in print form and as an e-book. Click here to purchase the book on Amazon, or click here to purchase the book direct from the publisher. The e-book can also be obtained from Smashwords by clicking here. Debby Feo, a popular author whose works can be purchased from Alban Lake Press and Nomadic Delirium Press (amongst other publishers), described The Man Who Killed Computers as “the best robot story she’d read since Asimov” on Twitter. High praise indeed!